The launch of Presidential Comprehensive Response Plan in Nigeria in July 2013 clearly states the direction and deliberate efforts of the Federal Government to drive issues of Ownership and Sustainability of HIV Response in Nigeria. With Nigeria’s HIV response deeply dependent on foreign donor funding and the continued dwindling foreign donor funding, there was a clear need for the government to step-up its game if she must begin to look in-country to fund her HIV Response. The government of Nigeria was handed over two states, based on mutual understanding by FHI 360 who are being funded by the US Government through President’s Emergency Plan for AIDS Relief (PEPFAR), the country now saddled with the responsibility of fully funding HIV Response in Abia and Taraba state, meaning all the thousands of Nigerians accessing and needing HIV/AIDS intervention services in these two states are to be solely funded by the federal government. The National Demographic and Health Survey (NDHS 2013) stated that Taraba State has 10.5% HIV prevalence rate, which makes the state to be in dire need of an effective and well-funded HIV Response to address HIV Prevention, Care and Treatment issues. The federal government of Nigeria through the National Agency for the Control of AIDS (NACA) took over the HIV response in Taraba state from 1st of April, 2015 and two years on; NACA seeks to assess the Ownership and Sustainability drive of the federal government hence the idea behind the Media Tour of HIV intervention sites of some selected facilities across Taraba state. The Director General, Taraba state Agency for the Control of AIDS (TACA) Alhaji Abba Ibrhaim was on ground to receive the media team. In his remarks at the entry meeting into the state, the DG said before now, Taraba HIV Response was dependent on Donor Funds but since 2015, the Nigeria government has taken over the funding of the HIV response in the state. Alhaji Abba said TACA is solely responsible for coordinating the state HIV Response, the State Ministry of Health (SMoH) is in charge of Care and Treatment while the State Ministry of Women Affairs takes care of issues around Orphans and Vulnerable Children. He went further to state that with the help World Bank Funding, over 17 Civil Society Organizations (CSO) have been trained and they have carried out different HIV intervention across the state. The DG TACA said the state have Counseled and Tested within the last one year about 55,000 persons and less than 5% of the result are positive, he hopes that by the time the next prevalence rate is conducted in the state, the prevalence rate will drop down because of the massive HIV interventions programmes carried out in the last 2 years through the help of federal government funding. “The Taraba state government has equally earmarked 600 million naira in the 2017 budget for HIV/AIDS to compliment the federal government Ownership and Sustainability drive” he concluded. 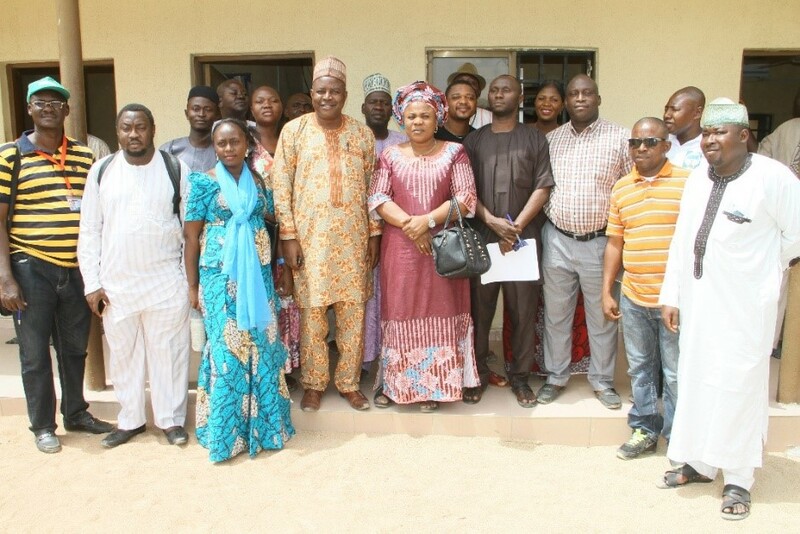 L-R Third from left Mrs.Toyin Aderibigbe Head of Communications Unit, National Agency for the Control of AIDS NACA, Alhaji Abba Saleh Ibrahim, Director General, Taraba Agency for the Control of AIDS (TACA), some TACA staff, Representatives of Network of People Living with HIV in Taraba state and some Health Correspondents during the media tour of selected HIV intervention sites in Jalingo, Taraba State. 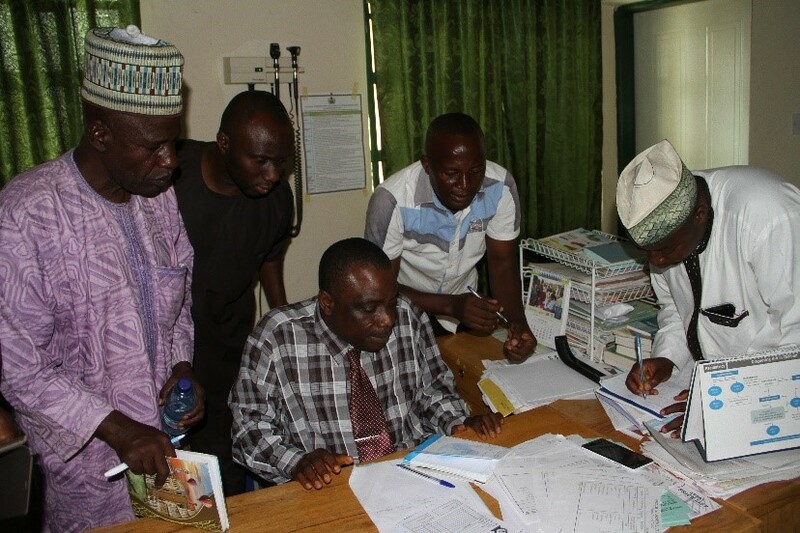 The Media Team was at the State Project Implementation Unit (SPIU) office of Taraba State Ministry of Health where the Team Lead Dr. Abe Agbu, briefed the media team on the achievements of the federal government since taking over the HIV Response in Taraba since 2015. Dr. Agbu said there are 21 Comprehensive sites and 69 sites offering Prevention of Mother-to-Child Transmission (PMTCT) services across the states. He said as at December 2016, 39, 818 persons with advanced HIV infection are receiving Antiretroviral Therapy (ART) and over 30,000 women have so far benefited from PMTCT services in the state, all these services are solely funded by the federal government he affirmed. Sharing some of the challenges the SPIU is facing in ensuring the HIV response run smoothly, Dr. Abe said due to the massive land mass of the state, the number of vehicles available for the team to move round is not enough and requested that the federal government provides additional vehicle to ease the movement going round the facilities. He hinted the media team about the challenges around logistics of getting drugs into the state which had in the past caused stock-out of drugs in many facilities across the state but he pointed out that NACA has been able to resolve this challenge and issue of drug stock-outs is now a thing of the past. The SPIU Team Lead said another major challenge is the breakdown of some vital laboratory equipment’s due to climatic conditions and most times power surge and this affect the programme a lot as it delays the investigations that are supposed to be carried out on patients. He requested that NACA should do its best to ensure that when there are such breakdown of equipment’s, the repairs should be speedier than it is at the moment. 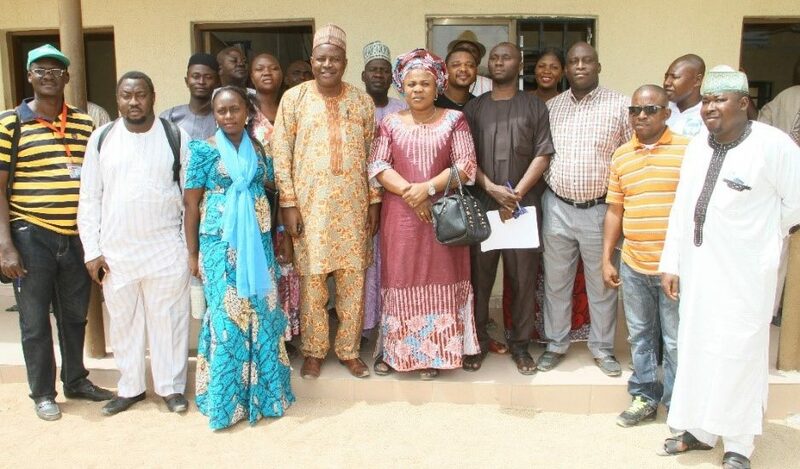 Group Picture after the visit to the Team Lead, SPIU, SMOH Taraba state, during the Media Tour of HIV Intervention sites in the state. At the Taraba State Specialist Hospital, the Coordinator, HIV Treatment Program in the hospital, Dr. Dashe Dasogot, received the Media Team. Dr. Dashe said the hospital has over 8000 persons receiving Care and Treatment in the hospital ever since the inception of HIV Program in the state and in the last two years, the federal government of Nigeria has successfully funded the HIV response in Taraba state. He went on to inform the Media Team that the laboratory reagents and consumables needed in the hospital are supplied by the federal government and the supplies are regular and of good quality. Dr. Dashe said the Cotrimoxazole antibiotic supplies is regular and it is really helping the patients especially those who are just on care and yet to commence treatment. He gave an insight on the Test and Treat policy, the Coordinator said it is desirous to commence the policy but it will involve a lot human and financial resources, so the government is mapping out strategies and ways of generating the resources needed before giving the directive to commence Test and Treat policy. 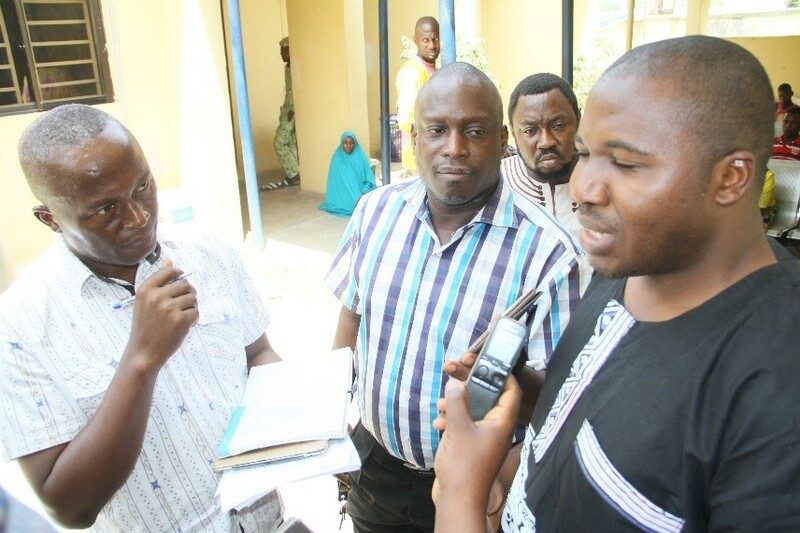 From Centre: Dr. Dashe Dasogot, Coordinator HIV Program, Taraba State Specialist Hospital, interacting with Health Correspondents during the media tour of selected HIV intervention sites in Jalingo, Taraba State. The situation is similar at the Government House Clinic visited during the media tour, where the Principal Medical Officer in the facility, Dr. Danga Danga was full of praises on the efforts of government in funding HIV programme in the state, he told health correspondents that 6000 patients are currently enrolled on Treatment and Care services in the hospital. Dr.Danga however did not hide his feelings over what he ascribed as a major challenge confronting the HIV programme in the facility, “breakdown of equipment’s is really affecting the manner we are able to manage our patients and it is a vital component of Care and Treatment, monitoring as part of treatment is very essential if patients must be managed successfully” he pleads with the federal government to urgently look into the matter as it will make the programme work more effectively and efficiently, he affirmed. 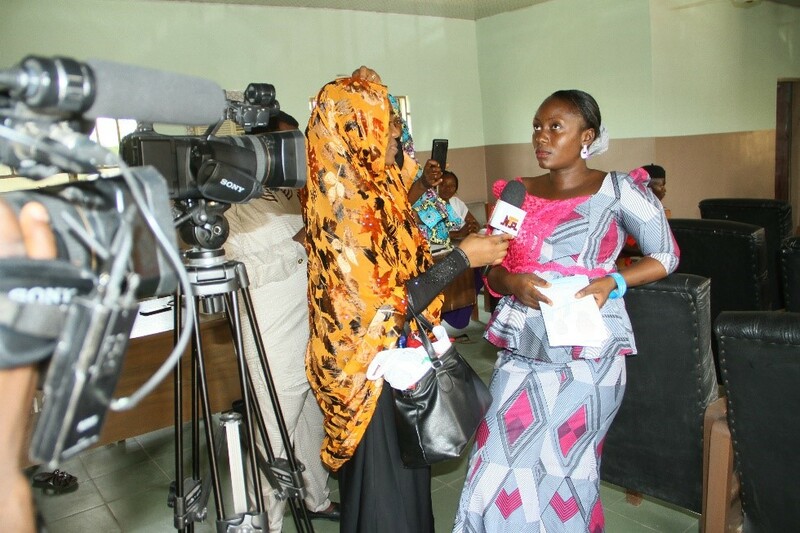 Dr. Danga Danga Principal Medical Officer, Government House Clinic Taraba state, interacting with cross section of Health Correspondents during the Media Tour visit to Government House Clinic in Taraba State. The Media Team took a tour of the Federal Medical Centre, Jalingo. 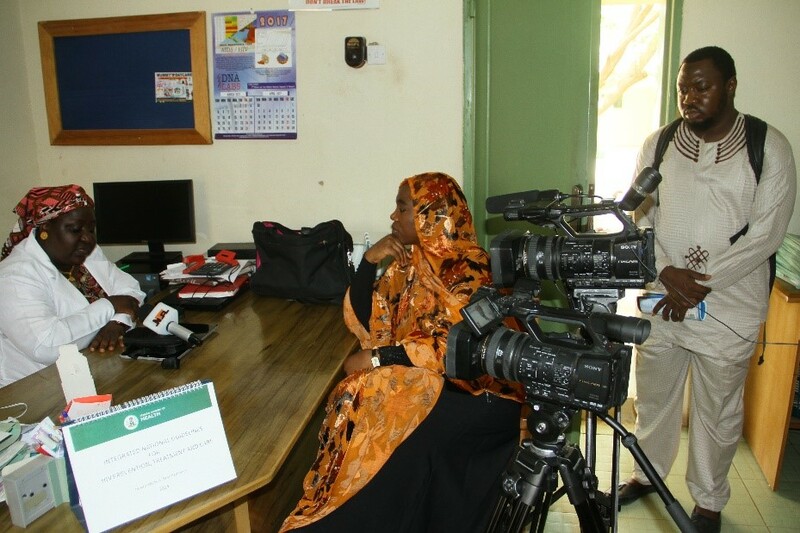 Dr. Ayisha Adamu, the Treatment Coordinator in the facility was delighted to interact with the media as she informed the team that 7000 thousand persons are accessing HIV services in the hospital and out of which 4000 are currently on Anti-retroviral Treatment (ART). The ART coordinator explained further that the federal government since taking over the funding of HIV response in the state has trained and provide equipment’s to ensure quality services are being provided to the people of the state. L-R: Dr. Ayisha Adamu, Treatment Coordinator, Federal Medical Centre Jalingo, Mrs. Rabbi Abdallah, Head, Health Desk, Nigeria Television Authority and Mr. Oluwashola Idris, Senior Communications Officer with NACA during an exclusive interview session at the just concluded Media Tour of HIV Intervention sites in Taraba State. Some beneficiaries who disclosed their gratitude to the federal government said that the HIV services they receive are free but they are made to pay for hospital cards which is not affordable to some patients because of their financial situations, they urge the state government to compliment the federal government efforts by making these hospital cards free. One of the beneficiaries of the PMTCT services in the facility spoke with the media, Hajia Salamatu Robo (Not real name), said she knew her HIV status 6 years ago when she got pregnant for her first baby, “it was a difficult moment of my life but thank God my husband tested negative and has remain negative, we now have 2 children and they are both negative”. Hajia Salamatu advised couples to support themselves if any of them test positive, because it helps to overcome the burden of being HIV Positive and reduces the chances of giving birth to HIV positive babies. The Media Team also met with a discordant couple who have been married for 3 years. Mr. Hamza Abu (Not real name) said his wife was negative when they met but discovered that she was HIV positive during her 1st pregnancy while attending antenatal clinics, with the help of quality counselling, he was able to support his wife through the process of PMTCT and they now have a baby boy who is HIV negative and she is pregnant again with our second baby, he said. Mr. Hamza who said he got employed through the government N-Power job creation scheme, thanked the federal government for providing job for the less privileged in the country and making PMTCT services free, he affirmed that ever since his wife tested positive, she has enjoyed free treatment and the drugs supplies have so far been regular except for sometimes late last year when stock-out of drugs was experienced in the state but things have since returned to normal. The Coordinator of Network of People Living with HIV in Taraba state, Mrs. Layidi Johnson briefed Health Correspondents on how grateful the people living with the virus in the state are for the efforts made by the federal government of Nigeria in ensuring funding is provided. She said Support Groups in the state are equally doing their best to support the HIV programme in different facilities within the state, Mrs. Johnson said a particular Support Group contributed money and bought a generator for the hospital where they are receiving Care and Treatment, since they discovered that power supply is a major challenge in that facility. The Coordinator went on to inform the media that in spite of the efforts by the federal government, there are areas where person living with HIV in the state needs government to assist to make life easier for them. She said they don’t get the stipends for refreshments and transport allowance which FHI use to give them when Support Group meeting are held, she said the refreshment and allowance encouraged most HIV positive members to look forward to the meeting. The meeting she said serves as forum to encourage and educate members on adherence to treatment, self-stigmatization and other important areas of HIV education. From Left:Mrs. Layidi Johnson, Coordinator Network of People Living with HIV in Taraba State, granting an exclusive interview with NTA Head of Health Desk, Mrs. Rabbi Abdallah during the Media Tour of HIV Intervention facilities in Taraba State. Also stated by Mrs. Johnson is the need for more treatment sites to be opened in more communities closer to people, she said due to the proximity of treatment sites and economic conditions of some patients, they are not able to pick up their drugs or even come forward for monitoring, there by leading to drug resistance or even death in some cases, she pleaded with both the federal and state governments including the private sector towards strive further to addressing the issues raised. The Ownership and Sustainability drive of the federal government of Nigeria is no doubt yielding positive fruits but there are still areas that need to be improved upon as highlighted by the Care Givers and some of the beneficiaries and relevant stakeholders who spoke with the media. It is important that government through NACA and SACA ensure that adequate funding is provided to avert stock-out of drugs round the year, maintenance and repairs of breakdown laboratory machines is giving necessary attention as this will ensure patients are not unnecessarily delayed from getting their investigations done which is vital to commencement of Care and Treatments. The state government must do her best to compliments federal government’s effort by not just budgeting funds for HIV Response in the state but ensure actual releases of the earmarked funds. The private sectors in the state must as matter of urgency begin to channel some of their Corporate Social Responsibilities towards HIV/AIDS interventions, as this will further bridge the gaps in our HIV Response as a country.